Ok fine, they didn’t quite say it was their recommendation, but you get the gist. It’s almost as if only the need to maintain the independence of the CBN is the only tenable defense in his favor. The contentious issue here is the foreign exchange rate. Before I go into further details, first a little background, starting with a pretty little picture I generated from Yahoo Finance. What the chart shows is a two year history of the official naira to USD exchange rate (blue line) and the oil price over the same period (red line). Forget the absolute numbers for the naira for a minute since they’re so low as to be insignificant and lets concentrate on the percentage drop. As almost everyone knows, around the middle of last year crude oil prices started a freefall that didn’t stop till this year when prices recovered somewhat to about half what they used to be. Nigeria operates a system where it “pegs” the value of the naira to the USD i.e the CBN says 155naira = 1 USD and that it is (kind of, our favorite abokis can sell at whatever price they want). You see, late last year and earlier this year there were “step” changes in the rate, that’s a result of the CBN saying ok, instead of 155, the naira is now going to be 168 to the dollar, and then eventually with the closure of the official auction systems and a move to interbank rates the CBN effectively devalued the currency again to around 200 to the dollar. These devaluations are due to the fact that, for the CBN to enforce a certain rate in the market, people have to be convinced, they need confidence that it is able to ensure that there is an adequate supply of dollars in the market for people to exchange whenever they may be so inclined. Since we don’t print dollars here and they don’t grow on trees yet, we have to earn them somehow in order to make them available. In Nigeria the main source is through crude oil sales. 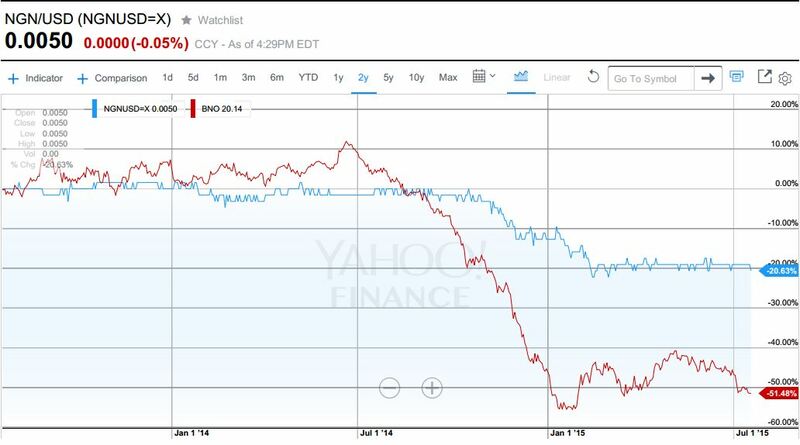 As crude oil value tanked, so did the ability of the CBN to maintain its previous pegs leading to the devaluations. It is a reality of life, ignoring it would have led to wiping out our external reserves and eventually to a speculative spree that may have seen a 400 to the dollar exchange rate. This is not far fetched, looked at what happened to the Ghanaian Cedi when the speculators came calling in the chart below (slightly different causes but you can make the link between speculations and exchange rates). In 2011 1 GHC = 100NGN and then the slow devaluation of the cedi (the Bank of Ghana doesn’t peg but intervenes in the market by supplying dollars). The two crazy peaks are mainly speculation driven as people suspected that BoG abilities to intervene were severely impaired. Note the rapid drop as soon as the concerns are addressed. 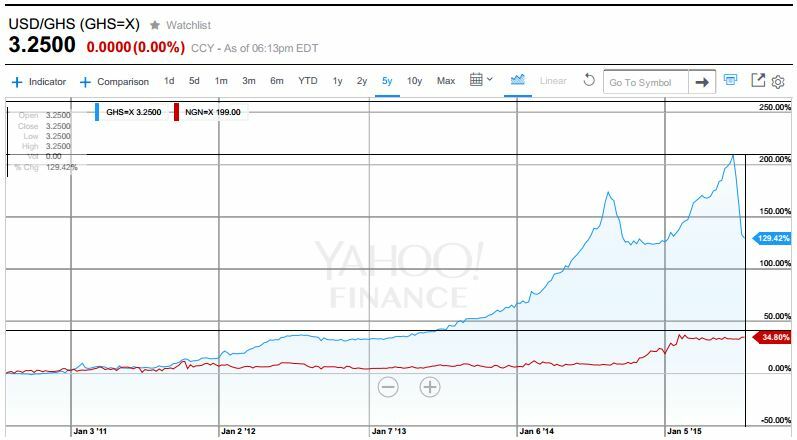 Chart generated from Yahoo Finance. The CBN correctly recognized that the exchange rates were unsustainable and that the drop in the oil price may not be transitory. On this last note they’re particularly right given that Brent Crude Futures are being priced at about $70 through 2020 at the moment. So the question is not whether a devaluation was needed, it was about how much was enough – and that is the cause of most of the arm-wringing and finger pointing. The Central Bank of Nigeria (CBN) is quite convinced that the pricing is at an appropriate level, many people don’t believe so and think a further devaluation is necessary and The Economist is obviously in that camp leading to the article from which I extracted the quote below. I understand that for the average person on the street devaluation is always a bad thing since it means almost everything becomes more expensive (hello inflation!). For the not so average, those foreign vacations and children’s school fees leave a bigger dent on the account. I feel your pain. But there are also good reasons to do it. But in the spirit of short attention spans and elevator pitches, I’ll deal with that and provide some more information on the CBN’s recent policies and what they are trying to achieve. The aim of course is for you to decide on your own if they actually do make sense. See you shortly.